I've mentioned before that my boyfriend and his roommates are a captive audience when I feel like trying something new in the kitchen....Or if I just want a bunch of hungry mouths to feed. Recently, they were gifted with a HUGE package of Omaha Steaks from some friends. It was thanks for a big favor, and although it was an unnecessary token (friends helping friends never need gifting) it was very well received. In honor of the large gift, the fellas hosted a BBQ midweek to shake up the summer doldrums. I decided that this would be a great time to try my hand at a grilled pizza. I wanted to make something mostly vegetarian since we would be consuming hamburgers, hot dogs, and sausage (yes all at once). On my way over to their place I picked up some essentials from Trader Joe's: Pizza dough - Normally I buy whole wheat, or just make my own...but time was at a premium, and I was making a veggie pizza for boys...might as well let them have their white crust; Onions/Garlic; Baby Arugula, and Gruyere cheese (yes, any excuse for Gruyere). I read a few articles on technique and decided that it would be best to prep all my ingredients before the grill even got heated up. The grilled pizza cooks quickly, so a grillin' chef needs to work fast. I started with the onions and garlic -- 2 large onions, and 2 cloves of garlic. I caramelized the onions in a pan using JB's proven method (the bf's roommate/best buddy). This involved adding balsamic vinegar to sweeten the onions and help the caramelization. Coming from a person who used to burn onions rather than caramelize them, let me tell you this works like a charm! 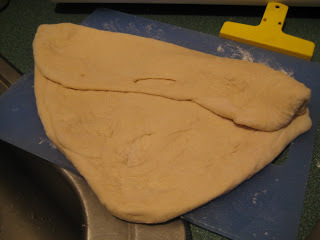 Next I rolled out the dough - again utilizing the Charles Shaw bottle - a different, but no less helpful utensil. (the dough is folded over in the picture because I carried it outside on the cutting board and I didn't want it to stretch too much as I walked outside). I sliced up some Gruyere and washed some arugula, and I was outside just as the grill was reaching the perfect temperature. 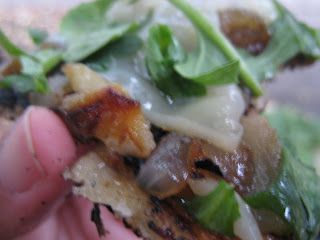 The caramelized onion mixture acted as a sauce - so that was spread on the dough first....Then the onions were topped with shaved slices of Gruyere cheese....then arugula. We had to work quickly so the cheese would melt before the dough burned....and we closed the top of the Weber-style charcoal grill for about a minute so the cheese would melt and the greens would just wilt slightly. Please pardon the fuzzy pictures! We ate this as soon as it came off the grill - so it was tough to snap a picture before we dug in....and the steam coming off the pie kept getting condensation on the camera lens! The pizza was really delicious. 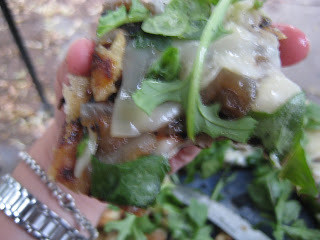 I loved the crispy char on the crust. I like a Neapolitan style pie so this was the closest I could get to brick oven pizza without an oven of my own! 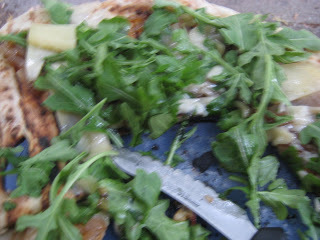 The flavor combo of the sweet onions, nutty cheese and bitter arugula were tasty too - so I would be willing to try it on a pizza stone for a dinner - or as an appetizer for a party. I think I want to try other combinations too - maybe an onion and mushroom pie? I would also love to try something with green onions, cheese, bacon and potatoes....I know it sounds weird, but I've had something similar before and its to-die! How about you? What non-traditional pizza toppings/combos are your favorite? Have you tried grilling pizza? This pizza looks delicious... and I love all your toppings! I love any excuse to have Gruyere too. And I wish I had a grill because I'd love to make grilled pizza! MMM, mashed potato pizza is definitely non-traditional, but it sounds so yummy! yes! i think we need a Clean Plate Club field trip for some mashed potato pizza made on the grill. sounds delicious! what else is involved in this JB proven carmelization process? I always end up burning my onions! !